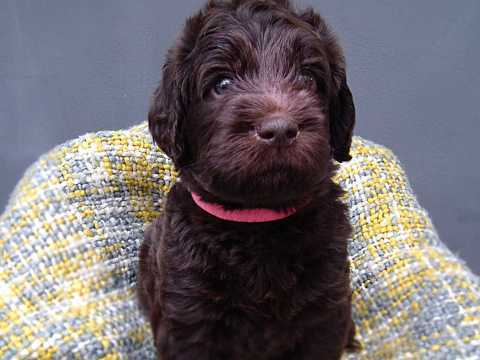 Born into a loving family, our little Labradoodle pups born 14.08.2018 are now available to view and reserve for taking home mid October 2018. 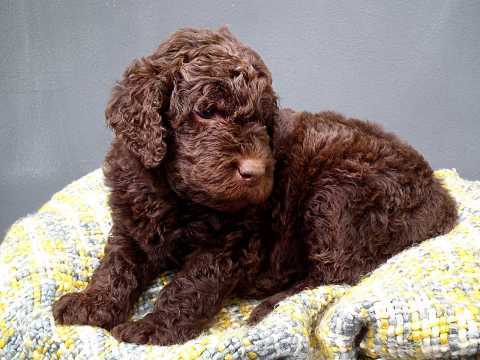 Fidjit, our gentle natured standard sized F2 chocolate Labradoodle who stands around 24-25" to her shoulder, weighing circa 25Kg. 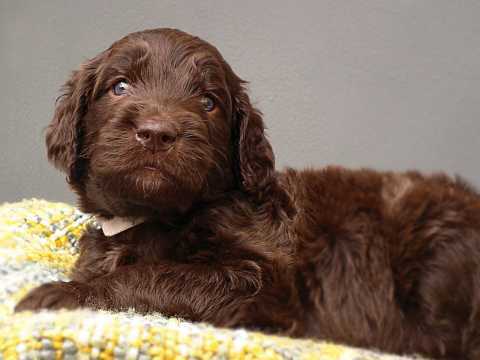 Gave birth to 9 multigenerational F4 Labradoodle pups this August; who are now ready for their new owners to select them. 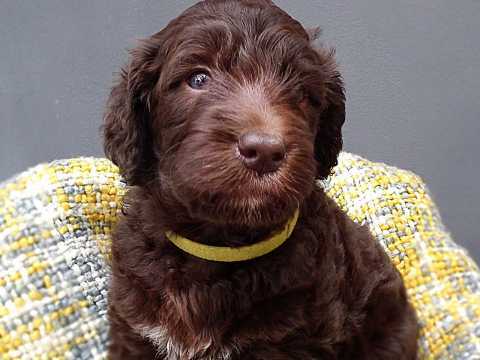 The father of the pups, named “Dougal” who is also advertised on the Pet for Homes website as a male stud, is also a standard sized F2 chocolate Labradoodle who stands around 24 -25" to the shoulder and weighs approximately 30Kg. Of the 9 puppies, we have 6 boys and 3 girls, of which 5 boys have already been reserved. Pictures are of the remaining puppies only + parents. Therefore we suggest that you contact us first to confirm which puppys are still available. Our pups are reared and cared for by their mum in our home and are used to everyday noises. Plus we try to handle the puppies as much as possible as a family, so they are not nervous around humans. Viewing of pups starts from week commencing 03.09.2018, where you can see them in their home with their mum and have the opportunity to ask any questions you may have about us, the parents, pups or breed. Pups will not be available to leave their mothers side until at least 8 weeks old (mid October), so these views are for selection purposes only. 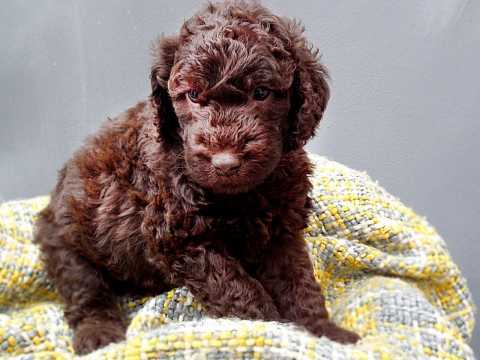 If a prospective buyer then wishes to reserve a puppy(s) we would require a security deposit for the pup to ensure buyers are serious about such a big commitment. Prices for pups are £1,250 irrespective of gender and coat type and before collection, all puppies will be wormed, flea treated, have had their first lot of vaccinations, be microchipped, checked over by our vet, and come with 1 months free insurance and a puppy pack to get the new owner started. Please check out the photos of Fidjit, Doogle and the remaining pups. We will continue to upload more pics as the pups grow. Thanks for viewing, all questions welcomed.